Governor Alfred E. Driscoll and the State Assembly selected Quercus rubra, Northern Red Oak, as the state tree on June 13, 1950. This stately tree was chosen to represent New Jersey for its strength, dignity, structural beauty, and long life. Collect acorns, including those of the Northern Red Oak, for the NJ Tree Nursery. Pick up acorns and store them in a gallon milk jug with the cap off. Drop off acorns at the nursery September 1 - October 30. Acorns will be planted and grown into trees to reforest New Jersey. For more information contact the Tree Nursery. New Jersey’s future forests are in your hands! The Northern red oak grows up to 100 feet tall, making it one of the largest tree species in New Jersey. In Warren County near the Musconetcong River grows the biggest Northern red oak on record in the state with a circumference of 20 feet, 1 inch. The red oak is a good choice for a street tree because it resists the salt used on roads and sidewalks. The introduced species Gypsy moth threatens our state tree. A single caterpillar can defoliate one square foot of leaf area per day. Black oak Quercus velutina and Northern red oak Quercus rubra have similar leaves, bark, and height. However, the inner bark of the Black oak is orange, and Northern red oak’s inner bark is white. The red oak’s acorn is larger with a flat cap, while Black oak’s acorn has a “helmet” cap. 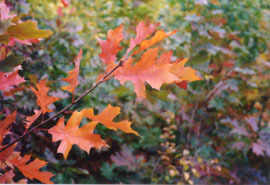 The Northern red oak has a broad range extending from Nova Scotia to North Carolina. Native Americans ground the acorns of the red oak with other types of acorns to make a flour used for food. The Northern red oak is nicknamed the “mighty” oak for its strong, deep root system. Northern red oak acorns mature in two years. Acorns of the red oak taste bitter, so many animals prefer the more tasty types of acorns to eat, leaving the red oak acorns to germinate.